The Gearheads began humbly as The Breaking Pointe, with Ken Ginger, Tim Dodson, Delf Dodge, Amanda Pata, and Steve Booher as team mentors. In our first year, 2002-2003, we had around 10 students as members of the team, and met in the Industrial Arts building at Grosse Pointe South High School. Delf Dodge, an employee of General Motors, was able to secure funding for the team from GM. In those days, the team’s logo was not the famed “Gearheads Crossing” we're known for today. Back at the beginning, just about every decision was made by the students. Therefore, it should come as no surprise that the first mascot was something quite strange: a rabid squirrel. In the team’s first season, we managed to produce a very small bot, which had many problems with the motors burning out. 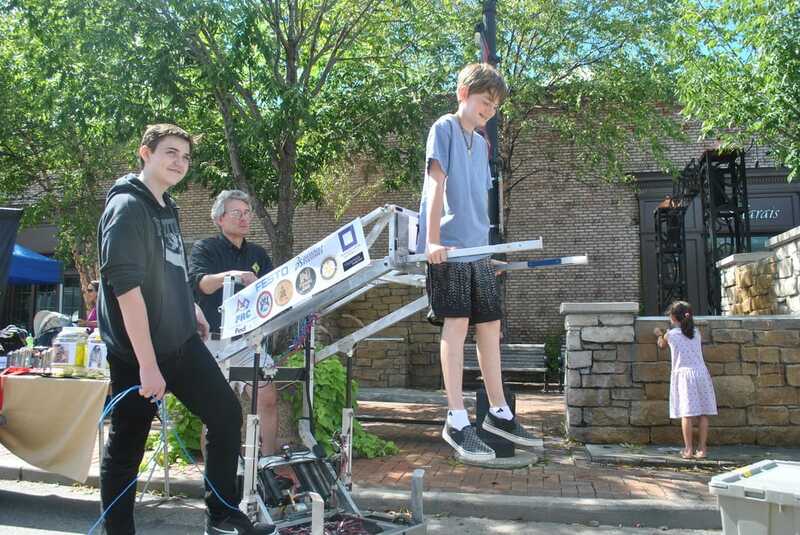 Due to the hard work of Mr. Ginger, and a handful of students, the bot was fabricated and participated in the competition that year. The first year was spent mostly trying to figure out what FIRST was all about. Soon afterward, with a little ingenuity, and the magic of Photoshop, Mr. Dodson’s son created the now iconic “Gearheads Crossing” logo. In the 2004-2005 season, the team officially became known as the Gearheads, and a team motto was decided- "we're all Gearheads!" This decision was made with the intent of communicating that everybody in FIRST Robotics is a Gearhead in some respect or another. As Mr. Dodson said, “it’s not about us beating you. It’s about unity.” This attitude eventually won the team multiple awards from FIRST, with the first awards being won at a competition at the University of Waterloo in 2006 (Imagery and Sportsmanship). During our time working in Grosse Pointe South's IA building, our shop was eventually relocated to the basement during renovation- right under a men's washroom. In dire need of more space and a better atmosphere, the team moved to our current location, the old Auto Shop at Grosse Pointe North High School. By the time the year 2010 rolled around, Mr. Ginger had moved on, and Mr. Dodson and Mrs. Dodge were on their way out of the Gearheads organization. (Though, at heart, they will always be a part of the Gearheads family.) That was the year when Don Pata became a mentor for the Gearheads. The following year, he became the head mentor and from that day forth, the Gearheads were never the same. Don Pata served as the Faculty Mentor of the team until the close of the 2015 season, when Mr. Sean McCarroll came in to lead the Gearheads for one season. After his departure, our current mentor, Mr. Jason Wolfsen stepped up as head mentor and has been with us since. In the 2017 season The Gearheads took home their first ever FIRST blue banner. In recognition of the teams contributions over the years to the mission of FIRST, the Gearheads won the District Chairman's Award at the Howell District Event in 2017 and again during the 2018 season at the Centerline event.